FSIP provides electronic products and battery maintenance equipment used on electric vehicles including industrial trucks, golf carts, scrubber-sweepers, mining cars/locomotives, electric boats, go-karts and ground support equipment. They will be showcasing their Xtender Battery Regenerator at booth #B2255 at Modex 2018, as well as other battery maintenance products. The Xtender Battery Regenerator restores and prolongs the lifespan of all sizes and types of lead-acid batteries including flooded, gel and AGM. FSIP is the exclusive distributor for the Xtender in North America. 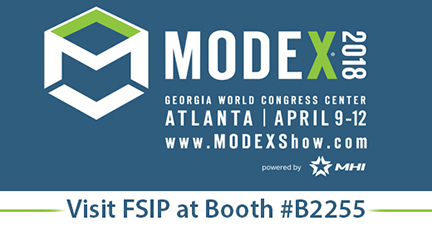 Modex 2018 will take place at the Georgia World Congress Center in Atlanta, Georgia from April 9th through 12th. Modex hosts the latest manufacturing and supply chain equipment and technologies, with over 800 companies exhibiting on the 250,000 square foot show floor. By attending the show, FSIP will identify new customers, strengthen relationships with current customers, promote brand awareness and network with other industry professionals.